Webinar hosted by APBP. For more information, see the APBP webpage. Streets comprise more than 80 percent of public space in cities but they often fail to provide their surrounding communities with a space where people can safely walk, bicycle, drive, take transit and socialize. A well-illustrated, concrete vision for the future of city streets, the Urban Street Design Guide charts the principles and practices of the nation’s foremost engineers, planners and designers working in cities today. The Guide offers a blueprint for designing 21st century streets, and unveils the toolbox and the tactics cities use to make streets safer, more livable, and more economically vibrant. 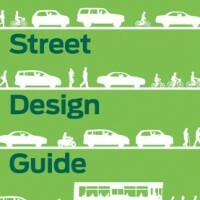 Hear from leading experts in street design who contributed to the guide’s development. This webinar will address how this resource will change the face of our nation’s streets, the ways you can use it in your community, and how specific topics and elements in the document differ from conventional practice. 1. To achieve a better understanding of how and why city streets demand a unique set of design tools specific to their peculiar needs and characteristics. 2. Learn how to implement different “interim” design strategies, including parklets, public plazas and temporary safety improvements for bicyclists and pedestrians. 3. Clarify how to utilize the guide as a tool for local and state advocacy, including basic information on NACTO’s endorsement campaign for the guide.